Matt West had arm problems in college and got passed over in the draft. He also gave up on baseball, according to The Palm Beach Post. Then a friend dared him to go to a tryout camp. He went and he got signed, The Post wrote. "I knew from the past that I had ability," West told The Post, "and after I gave it some thought, I figured I could concentrate on it and maybe get signed." West went from there all the way to AAA. He even got in the conversation to make Atlanta. Injuries, though, came back and he never made the majors. He then went on to a brief minor league coaching and managerial career. West's career began in 1981, signed by the Braves as an undrafted free agent out of Long Beach State University. 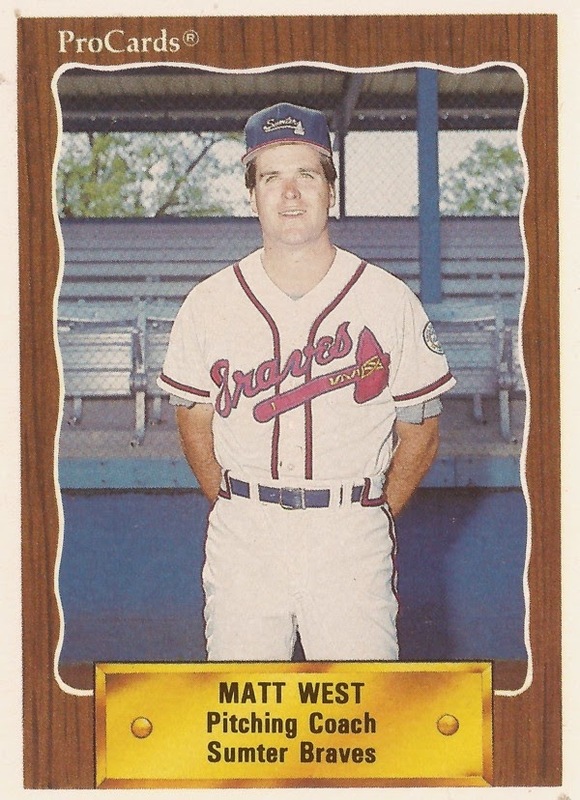 West started with the Braves in the Gulf Coast League. He went 3-4, with a 2.66 ERA. He moved up to AA Savannah in 1982. In 22 starts there, he went 6-8, with a 4.59 ERA. He played 1983 at single-A Durham and then 1984 at AA Greenville. At Greenville, West went 10-7, with a 4.47 ERA. He played his 1985 season at AAA Richmond. In 23 starts there, he had a 3.71 ERA. In a May game, West went into the sixth inning with a no-hitter. He went on to throw a complete-game two-hitter. His 1986 season ended up being limited due to shoulder surgery. He only got two rehab starts back in the GCL. Coming back for 1987, West still found himself in the conversation for the Braves' fifth starter position, according to The Associated Press. The problem for West, though, was that others were in that same conversation. He played the year back at Richmond. He played 1988 in the Mariners system, seeing both AA Vermont and AAA Calgary. It was his final season as a player. West started his coaching career the next season at rookie Pulaski for the Braves. He moved to Sumter in 1990 where he and manager Ned Yost helped move Mark Wohlers to the bullpen. He then served as pitching coach at Durham. West moved up to managing for 1994 and 1995, doing so also at Durham. In May 1995, West was the manager during an infamous brawl where one of his pitchers kicked an opposing player in the head. In 2013, West returned to Durham for opening day. He talked to The Durham Herald Sun about the lasting effects of baseball. "The game never leaves you," West told The Herald Sun. "It doesn't matter what side of the field you're on. It's such a great game, and it's such a great thing to be a part of."